No-one in our family is very talkative at breakfast time. On a weekday that is. It suits me perfectly as the breakfast cakes and muffins that I bake the night before for my sweet-tooth husband are at stake. If husband mumbles a "Those ones are really nice!" before 7am in the morning, then they are. So it happened with these carrot muffins. An old recipe from my own blog that I reviewed and tried to improve a little. 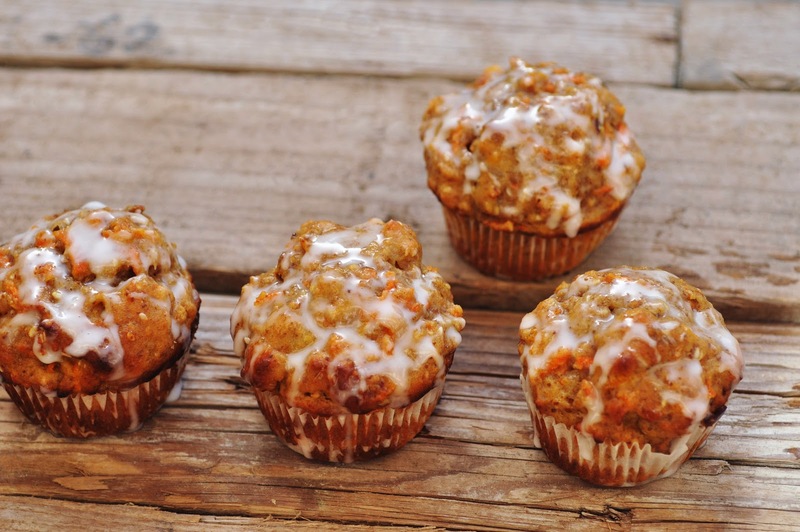 No sugar is needed as these muffins are sweetened with dried dates. I used olive instead of vegetable oil. And I added flax meal for further nutritional value, that would in return justify a little indulgent lemon icing drizzle. Bon appetit! Preheat the oven to 175C/375F. Grease or line muffin tins. In a bowl, sift together flour, flax meal, baking powder, baking soda and salt. Set aside. In a small bowl, beat the egg. Whisk in olive oil and vanilla extract. Set aside. In a food processor, combine yogurt and chopped dates. Combine with egg mixture. Mix dry and wet ingredients until just combined fold in grated carrots and seeds. Spoon batter into muffin tins. Bake for 18-20 minutes, or until inserted toothpick come out clean. Let cool completely on wire racks before frosting. Mix icing sugar and lemon juice together until it becomes a creamy paste. Drizzle over the cooled muffins. Let the frosting become solid before serving.